Traumatic brain injury (TBI) remains a major health problem with serious socio-economic consequences. Although its incidence is decreasing in most western countries according to some estimates, severe TBI will become the third most common cause of death and disability globally by the year 2020. In 1996, 3740 deaths from serious injuries were recorded in the United Kingdom. The death rate for all ages from a head injury in the United Kingdom is 9 deaths per 100,000 population per year, or 1% of all deaths, or 15-20% of deaths of persons aged 5-35 years. Almost half of patients presenting to emergency departments with a head injury (1 million/y) are children younger than 16 years. The most common causes of injury are falls (41%), assaults (20%), and road traffic accidents (13%). Road traffic accidents account for 58% of all deaths from head injury. In 1997, a fatal injury (all causes) cost the nation £902,500, a major injury cost £102,880, and a minor injury cost £7970. CNS injuries remain the leading cause of morbidity and mortality for young people throughout the world. In 1998, 148,000 Americans died from various injuries. Traumatic brain injuries (TBIs) caused 50,000 deaths. The average incidence (combined hospitalization and mortality rates) is 95 cases per 100,000 population. Twenty-two percent of people who have a TBI die from their injuries. In addition, approximately 10,000-20,000 spinal cord injuries occur each year. The risk of incurring a TBI is especially high among adolescents, young adults, and people older than 75 years. For all ages, the risk of TBI is twice as high for males as for females. Motor vehicle crashes, violence, and falls are the leading causes of TBI. Nearly two thirds of firearm-related TBIs are classified as suicidal in intent. The leading causes of TBI vary according to age. Falls are the leading cause of TBI among people aged 65 years and older, whereas transportation accident leads among persons aged 5-64 years. Firearms surpassed motor vehicles as the largest single cause of death associated with TBI in the United States in 1990. The outcome of these injuries varies greatly depending on the cause. Death results from 91% of firearm-related TBIs, but only 11% of fall-related TBIs are fatal. Only a few analyses of the monetary costs of these injuries are available. The estimated total costs for the year 1985 were $37.8 billion. 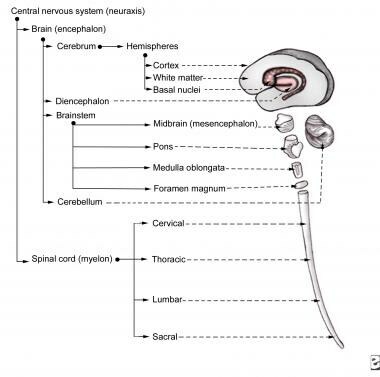 The brain and the spinal cord make up the CNS and is illustrated in the image below. The brain, surrounded by its 3 membranes (also known as meninges), is encased in the skull. The scalp covers the bone of the top of the skull or vault, while the facial bones and muscles and the neck muscles cover the base of the skull. A deep projection of the dura (the outer and hardest of the brain meninges) known as the falx cerebri divides the brain into the cerebral hemispheres. Another projection, known as the tentorium, divides the cerebral hemispheres from the posterior fossa, which contains the cerebellum. Initial evaluation and management of CNS injury. Schematic representation of the brain and the spinal cord. The brain stem arises from the middle of the cerebral hemispheres, descends through an opening of the tentorium (tentorium hiatus), and continues as spinal cord after the foramen magnum. The spinal cord exits the cranial cavity through an opening at the base of the skull and the top of the cervical spine (foramen magnum). In adults, it extends down to the level of the 12th thoracic or first lumbar vertebra. In children, the spinal cord terminates much lower, depending on the age of the child. Consciousness is defined as the ability to be aware of oneself and one's surroundings. The reticular formation, a very complicated and poorly defined collection of nerve cells in the brain stem, continuously maintains the activity of the rest of the brain and is considered responsible for maintaining consciousness. Intracranial pressure (ICP) is the normally positive pressure present in the cranial cavity. It ranges from 5 mm Hg in an infant to 15 mm Hg in an adult. Cerebral perfusion pressure (CPP) equals mean blood pressure (BP) minus ICP. CPP should be maintained at higher than 70 mm Hg in adults and at higher than 60 mm Hg in children. Maintaining adequate circulation in the brain is of vital importance. If cerebral perfusion falls below 12 mL/mg/min, then irreversible damage to neuronal cells occurs. Cerebral blood flow is kept stable under normal conditions due to linear changes in cerebrovascular resistance. This phenomenon is called cerebral autoregulation and means that changes in CPP between 50 mm Hg and 150 mm Hg do not cause significant changes in the cerebral blood flow. However, under traumatic conditions, autoregulation is lost, resulting in a linear relationship of BP to cerebral blood flow. Therefore, maintenance of adequate BP is of vital importance for brain survival. Because the cranium is a closed space, the sum of the intracranial volumes of brain, blood, cerebrospinal fluid (CSF), and other components (eg, hematomas, mass lesions) are constant. This is called the Kellie-Monro principle and implies that changes in one of the intracranial components will result in compensatory alteration in the others. Because the amount of blood and CSF that can be pushed out of the cranium is limited, increases of ICP above a certain level cause herniation of the brain matter through natural openings such as the tentorium hiatus (uncal herniation) or the foramen magnum (hindbrain herniation). Both herniations can result in brain stem compression and death (conning). Uncal herniation compresses the ipsilateral III cranial nerve (oculomotor), resulting in dilatation of the ipsilateral pupil. This is a well-known localizing sign of intracranial pathology causing mass effect. The initial injury to the brain or the spinal cord can only be avoided by implementing general preventative measures. Thus, the major concern in the management of patients with head injuries is early detection and minimization of any secondary insults. Effective evaluation and management of CNS injury necessitates proper understanding of the circumstances in which the injury occurred. In other words, obtaining the history is a vital first step in the treatment of patients with CNS injuries. Classification of CNS injury is also of vital importance both in providing and streamlining the appropriate care. CNS injury can be divided into cranial or spinal injury, closed or penetrating injury, or other type of injury, such as electrical. CNS injury can be the only injury, or it can occur in patients with multiple traumas. In all multitrauma cases, patients must be treated according to the advanced trauma life support (ATLS) protocols (ie, airway, breathing, circulation, disability [ABCD]) because any patient will die much more quickly from systemic injuries than from CNS injuries. Care of patients with CNS injuries is a multidisciplinary endeavor. Paramedics, emergency medicine specialists, trauma specialists, neurosurgeons, neurointensivists, neuroradiologists, and an array of highly specialized nursing and technical staff are all integral parts of modern effective treatment for this potentially devastating condition. Management of any obvious or potential CNS injury should be part of the overall patient stabilization and preparation at the scene of the injury, before transfer to the hospital. The circumstances of the accident or injury should be assessed quickly, and any potential risk of CNS injury should be identified alongside the rest of the injuries in order to help guide appropriate care. Avoid moving the patient if at all possible; this can be dangerous, especially after high-velocity injuries. The most important immediate protective maneuver for any CNS injury is securing and preserving the airway, maintaining and supporting breathing, and maintaining effective circulation. Protecting the spine (especially, but not exclusively, the cervical spine) should also be among the first priorities of the person providing care. The patient's neck should not be hyperextended, hyperflexed, or rotated, which is especially difficult to avoid while trying to maintain the airway. Ideally, preventing such neck movements can be facilitated with appropriate cervical immobilization devices (eg, hard collar and tape, as shown in the image below). If these are not immediately available, sandbags or rolled-up pieces of clothing can be used as temporary support until a paramedic crew arrives. Use of spinal boards is very important because they offer a very effective and easy-to-use means of transferring trauma patients. Initial evaluation and management of CNS injury. 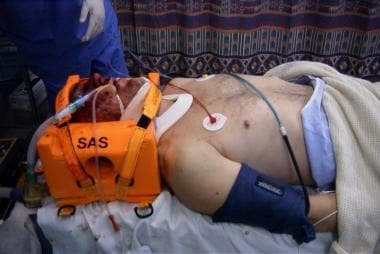 Patient with head injury in the emergency department with full neck protection. Accordingly, patients with severe head injuries should have their airways secured, with intubation, if available,  but intubation should not delay transfer and should be performed without sedatives and muscle relaxants in order to avoid obscuring the neurological status. Furthermore, care should be exercised during intubation in order to avoid hyperextension of the cervical spine, thus aggravating a potential spinal cord injury. If spinal injury is definitely suspected in an unconscious patient (suggestive symptoms: abdominal breathing and/or priapism), blind nasal intubation or an attempt at intubation without any neck movement is suggested. Asking patients simple questions, such as their name and areas of pain, and providing plenty of reassurance helps calm them and helps in the assessment of their neurological status. If appropriate responses are received, then simple commands to move arms and legs should provide an immediate overview of the gross neurological status. Of course, keep in mind that a trauma patient may have peripheral injuries (eg, fractures) that make movement extremely painful or do not allow movement of the affected limb. Obtaining a quick past medical and, most importantly, drug and allergy history, is also necessary at this point. If the patient is unable to provide any such information, immediate relatives should be questioned. Effective pain relief is important in the initial treatment of a trauma patient. However, when significant head injury is suggested, caution should be exercised when administering high doses of opiates or other sedatives, which may depress the level of consciousness and make clinical assessment of the patient difficult. A head injury is not always apparent, and if opiates or other sedatives have been administered, remember that a depressed level of consciousness may not be due solely to the pharmacological effects of the drugs administered. Scalp lacerations can be a significant source of bleeding. They should be covered, and pressure should be applied to control the bleeding. Do not attempt to remove any penetrating foreign body because this can result in more severe damage to the underlying tissues. Normotension is the goal, although the trend is moving away from aggressive fluid loading, since increasing, though mainly experimental, evidence indicates that such an approach may adversely affect outcome. Crystalloids are routinely used in the prehospital setting, and no evidence supports the prehospital use of mannitol. A resurgence of interest in the prehospital use of hypertonic solutions ("short volume resuscitation") has occurred,  and such use is increasing in many European countries (eg, Sweden). However, no randomized trial has yet shown conclusive benefit to their use in severe head injuries. If the patient is or becomes drowsy or comatose or has significant facial injuries, consider intubation/ventilation for airway protection and safe transfer. Patients with a score lower than 8 on the Glasgow Coma Scale (GCS), shown in the image below, should definitely be intubated before transfer. Assessing and accurately recording the GCS score before intubation is important because this is a very important piece of information used in further decision-making (also see the Glasgow Coma Scale calculator). Initial evaluation and management of CNS injury. 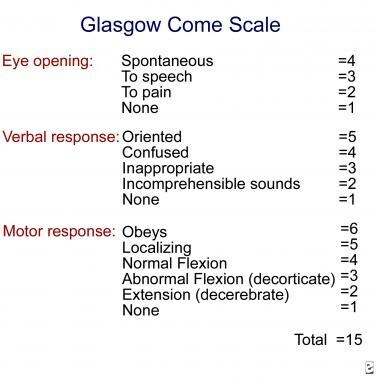 Glasgow Coma Scale. When describing the GCS score, reporting the constitutive parts separately (eg, Ex [eye opening score], Vy [verbal response score], Mz [motor response score]) is more helpful, rather than giving a total number. Remember that the GCS score cannot be 0. Pupillary asymmetry and reaction to light are well-known and important aspects of both the initial assessment and subsequent monitoring of any patient with a possible CNS injury. They are more important in patients who are intubated or unconscious because they can indicate significant intracranial pathology. Again, when assessing the pupillary reaction, remembering any pertinent medical history findings (eg, drug overdose, preexisting blindness, local eye injury) that can result in abnormal pupillary responses is very important. Upon arrival at the emergency department, the same protocols of transfer and patient handling should be followed carefully. Triaging the patient upon arrival is an integral part of the initial assessment, especially in a multicasualty situation. Head injuries can be classified according to the GCS score as minor (GCS score ≥14), moderate (GCS score ≤13 and ≥9), and severe (GCS score ≤8). All patients with severe head injuries should arrive in the emergency department intubated and ventilated. If a patient with severe or moderate head injury arrives with an unprotected airway, institute immediate measures for transfer to the resuscitation area. A patient who is deteriorating should also receive care intheresuscitation area. With facial fractures, auscultate the carotids for bruit, indicating possible carotid dissection. Do not forget to reassess patients at frequent intervals because their neurological condition can change rapidly. If the x-ray film reveals CNS injury, as shown in the images below, admit the patient to the hospital and, ideally, have a CT scan of the head performed. Initial evaluation and management of CNS injury. 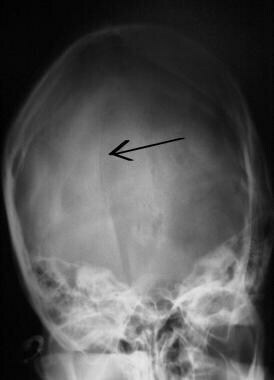 Linear occipital skull fracture (arrow). Initial evaluation and management of CNS injury. 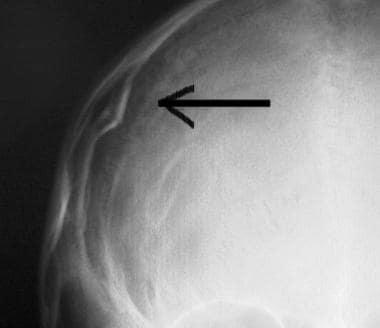 Depressed skull fracture (arrow). Initial evaluation and management of CNS injury. 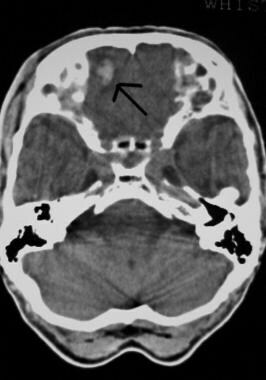 Frontal contusions on head CT scan image (arrow). The likelihood of intracranial pathology after head injury increases considerably with impairment of consciousness and the presence of a skull fracture. See the image below. Initial evaluation and management of CNS injury. 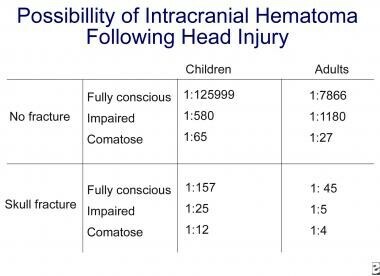 Likelihood of intracranial hematoma following head injury. All patients with moderate head injury (GCS score ≤13 and ≥9) should undergo CT scan of the head and should be admitted to the hospital. If the CT scan findings reveal CNS injury, referral to the neurosurgical unit is imperative. If the CT scan findings are unremarkable, the patient must be admitted for observation. A patient with a moderate head injury and normal CT scan findings should improve within hours of admission. If no improvement is noticed, the CT scan should be repeated. Neurological observations should be performed every 2 hours. The patient should take nothing by mouth until alert. Start intravenous administration of 0.9% sodium chloride solution (plus 20 mmol of potassium chloride if the patient is vomiting). Mild analgesics (eg, paracetamol, codeine phosphate) and antiemetics can be prescribed if necessary. Avoid phenothiazines because they can lower the seizure threshold. The head should be elevated (30-45°). Keep the neck straight, and avoid constriction of venous return. Maintain normovolemia and normal BP (mean BP >90 mm Hg). Ventilate to normocapnia and avoid hypocapnia (PCO2 >3.5 kPa). Use light sedation and analgesia (eg, codeine phosphate at 30-60 mg IM q4h). Consider administration of mannitol (1 g/kg IV immediately), but contact the neurosurgical registrar first. Emergency surgical treatment in the emergency department should not be necessary in areas of well-established neurosurgical care. However, if immediate neurosurgical care is not available, making exploratory burr holes may be necessary. CT scan facilities are not likely to be available; therefore, clinical acumen is very important under these circumstances. Burr holes are made primarily for diagnostic purposes because most acute hematomas are too congealed to be removed through the hole and the most common intracranial hematoma is subdural rather than extradural. However, making burr holes can help achieve modest decompression, and ideally, the physician should be prepared to proceed to a full trauma craniotomy. In any case, no such procedure should be undertaken unless it has been authorized by the referring neurosurgical unit. No CT scan facilities are immediately available. No neurosurgical referral center is immediately available. The patient is deteriorating rapidly, with one pupil fixed and dilated, and the patient does not respond to mannitol. The patient is dying from brain stem herniation. Place burr holes along the possible line of a trauma craniotomy and on the side of the dilating pupil or the pupil that dilated first (if known). Start just in front of the ear (1-1.5 cm) and above the zygomatic arch. If no hematoma is encountered, consider opening the dura, especially if a bluish discoloration suggests a subdural hematoma. The vast majority (>70% in adults and >60% in children) of spinal injuries involve the cervical spine, the most mobile part of the vertebral column. In children, the upper cervical spine (between C2 and the occiput) is more commonly injured, while in adults, the middle-to-lower cervical spine is the most common casualty. Because of the likelihood of spinal injury, any patient who incurs trauma should be treated as having potential spinal injury until radiographic and clinical evidence indicates otherwise. Immediate immobilization of the cervical spine in the appropriate collar and immediate immobilization of the rest of the spine on a spinal board is appropriate. Imaging of the spine should include at least plain x-ray films of the cervical spine (anteroposterior and lateral, a peg view, and with the C7-T1 junction visible). When a spinal injury is strongly suggested, that is, due to the mode of injury or because of indicative findings on the x-ray film, a CT scan of the spine should be performed next. Upon arrival at the emergency department, the patient should have been placed on a protective spinal board. Full clinical examination and assessment should follow initial stabilization. Beware of neck extension if intubation is needed. Check palpable steps over the whole spine during the secondary survey. Check for clinical signs of cord injury. Do not forget the bladder (catheterization may be necessary). Be aware of the possibility of spinal shock, that is, hypotension due to loss of sympathetic tone that is associated with bradycardia. Fluid administration to correct imbalances, with or without added pressor agents, is necessary to maintain a mean arterial pressure greater than 90 mm Hg (dopamine is the agent of choice), but do not overload because this can lead to heart failure. Also be aware that lack of tachycardia can mask a true fluid loss. 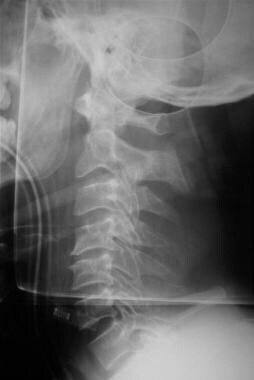 Plain lateral x-ray films of the cervical spine, as shown below, should be the least of the investigations performed. Examine for alignment, soft tissue swelling, steps, or fractures. If clinical or radiological evidence of a spinal injury is present, the immediate management of the patient following stabilization includes analgesia, full imaging, and consultation with spinal surgeons. Initial evaluation and management of CNS injury. Lateral spine x-ray film. An absence of radiological evidence confirming a spinal injury should not lead to a relaxation of precautions until the patient is lucid and cooperative enough to move all limbs and report any areas of excessive tenderness. Spinal cord injury without radiographic abnormality (ie, SCIWORA) occurs in approximately 2-4% of spinal injuries. Atlantooccipital dislocation: These are almost universally fatal, but prompt recognition and stabilization can be very important. Atlas fractures: Depending on the type, most are treated conservatively. Axis fractures: These are difficult to treat due to high nonunion rates, but most require some form of internal fixation. C3-T1 injuries: Early reduction and alignment are important. Decompression of the spinal cord is advocated for patients with incomplete injuries. The National Acute Spinal Cord Injury Studies (NASCIS) I and II published in the 1990s demonstrated significant benefit in administering high doses of methylprednisolone early after a spinal cord injury (within 8 h). The dose is 30 mg/kg IV over 15 minutes, followed by 5.4 mg/kg/h via continuous intravenous infusion over 24 hours. The NASCIS I and II trials have received significant criticism with regards to both their design and the possible benefit-to-risk ratio. Most experts and authorities in spinal injury would not advise the routine use of steroids in spinal cord injury. The recent evidence from the CRASH trial in head injuries further reinforced this view. Management of spinal injuries, however, should always be guided by local guidelines. Intravenous fluid replacement is an integral part in the resuscitation process. The age of the patient and the presence of other injuries that can result in severe hypovolemia, such as vascular injuries, intra-abdominal hemorrhages, or pelvic fractures, are of vital importance. Special care should also be taken in the presence of severe spinal injury (paraplegia or tetraplegia), which can result in spinal shock due to lack of sympathetic outflow. This can last 8-12 hours and is manifested with severe hypotension not associated with tachycardia, sweating, or peripheral vasoconstriction. Attempting to support the blood pressure with large volumes of fluids can lead to significant problems when the spinal shock recedes and sympathetic tone returns. The excessive fluid load can result in heart failure and, in the case of brain injury, aggravate brain edema. There is no evidence on the best replacement fluid for patients with brain injury. Published guidelines do not support any specific fluid, but isotonic crystalloid solutions (eg, sodium chloride) are generally recommended. Hypotonic solutions (eg, Ringers lactate or dextrose/saline) should be avoided though,  except in children, in whom dextrose/saline is routinely used. In cases of severe hypovolemia due to trauma, rapid volume replacement with colloids or human albumin is not contraindicated. In general, fluid resuscitation should be guided by the coexistent trauma and aim to maintain a brain injury patient in a euvolemic state. The concept of “running patients dry” is considered obsolete. Such an approach can compromise the cerebral blood flow and adversely affect outcome. There is an ongoing controversy on the value of early mannitol administration in suspected brain injury. The original perception that mannitol works by “dehydrating” the brain and thus reducing the intracranial pressure (ICP) has been refuted and it is now known that its main effect is rheologic. By decreasing blood viscosity, mannitol increases cerebral blood flow, resulting in partial reactive vasoconstriction of arterioles and reduction in ICP. Even when it does not achieve any significant ICP reduction, mannitol can still increase cerebral blood flow by almost 30%. Moreover, the timing and rate of mannitol administration as well as the specific indications for its administration have never been subjected to a randomized trial. In the United States, all severe head injury patients with abnormal pupillary signs routinely receive 100 mL of mannitol 20% upon arrival in the emergency department. Traditionally most neurosurgeons in the United Kingdom would recommend administering 1 g/kg mannitol 20% as a bolus infusion. The published guidelines also indicate that plasma osmolality should be kept at less than 320 mOsm. In the acute situation, this is less of a concern, but it should always be kept in mind, as occasionally these patients remain in the resuscitation area for long periods. If mannitol is administered to a patient, he or she should be catheterized. It is likely, however, that much higher doses than those recommended above are actually required. Recent evidence from 2 randomized trials from the same group [17, 18] has demonstrated significantly improved recovery rates of severe head injury patients who received upon arrival and before CT scanning an initial bolus infusion of mannitol 20% at 0.6-0.7 g/kg. After CT scanning confirmed the presence of acute subdural hematoma or intracerebral contusions, those patients who had normal pupils received a further 0.6-0.7 g/kg, while those with unequal pupils received a further 1-1.4 g/kg. In both groups of patients, concomitant administration of saline was used to correct the diuretic effect of the mannitol and maintain euvolemia. Although not all questions have been resolved by these studies, they support the early and aggressive use of mannitol in brain injury patients. Hypertonic solutions have recently gained popularity in the treatment of trauma patients. There is some evidence that hypertonic saline can be used as an alternative to mannitol, especially in children. Infusions of 3% sodium chloride solution have been shown to reduce ICP and improve outcomes in children  but not in adults. In a recent meta-analysis  of 5 randomized clinical trials, hypertonic sodium solutions were found to be more effective than mannitol in controlling episodes of elevated ICP. No evidence to support better clinical outcome is currently available, and a large randomized trial is warranted. Anticonvulsants are also not recommended routinely in brain injury patients who are not having seizures. Immediate (on impact) seizure activity is commonly reported, especially in children. It can last from a few seconds to a minute and is not considered true epilepsy. It is now thought to be a brief functional decerebration that results from loss of cortical inhibition. The recovery phase is usually brief and the risk of later seizures is not increased. No anticonvulsants are indicated in this case. If the patient is having seizures upon or immediately after arrival, anticonvulsants should be administered after immediate control with diazepam or lorazepam (preferably) has been achieved. A recent meta-analysis of 47 controlled trials on seizure prevention supported the use of phenytoin as the agent of choice in traumatic brain injury. It is also very important to realize that seizures adversely compromise the oxygenation of any severe head injury patient. Immediate airway support and early control is, therefore, imperative. It is crucial to achieve and maintain adequate plasma levels of anticonvulsants in a brain injury patient. For phenytoin, an intravenous loading dose of 18 mg/kg is recommended for adults and 20 mg/kg for children. Slow administration (over 30 min), preferably with an intravenous pump, is recommended. It is also important to remember, however, that after control of seizures has been macroscopically achieved, an unusually prolonged postictal state may actually be poorly controlled seizures (ie, status epilepticus). If adequate anticonvulsants have been administered (ideally, if electroencephalography has excluded status epilepticus), then other causes should be explored. In the United Kingdom each year, more than 1 million patients are admitted to the hospital following a head injury. Almost half are children younger than 16 years. Head injury is the most common cause of disability and death in children and young adults. In newborns with open fontanels, normal ICP is between 1.5 mm Hg and 6 mm Hg. In young children, it is 3-5 mm Hg. In contrast, the upper level of the reference range in adults is 15 mm Hg. Brain water content is 90% in children and 75% in adolescents. Myelination is absent at birth and slowly increases until adolescence. Cerebral blood flow is less than 50% that of an adult until age 3-4 years and reaches adult levels in adolescence. The most common causes are falls and road traffic accidents. Other causes are birth trauma, child abuse, and sports injuries. History findings are very important. In neonates, obtaining a detailed delivery history could reveal possible findings of birth trauma. In children younger than 2 years, falls are the most common mode of injury, but they rarely result in severe trauma. Always exclude child abuse. A history of repeated previous injuries should raise suspicions. Head injuries in children can be categorized as minor, moderate, and severe. Minor injuries are characterized by no loss of consciousness, children crying for a short time but being generally well afterwards, and a low-impact mode of accident. Moderate injuries are characterized by a loss of consciousness, persistent vomiting or headache, and skull fracture (GCS score of ≥14). Severe injuries are characterized by impaired consciousness (GCS score < 13), focal neurology, and high-velocity impact. Examination and management of children with acute head injuries should parallel ATLS protocols in adults. The ABCs should be monitored in the initial assessment of any head injury. Fall from a significant height (depends on the age and build of the child). Children with head injuries usually present with normal BP and tachycardia. Bradycardia is highly suggestive of increased ICP. Hypotension is rarely due to head injury; therefore, seek other causes if it is present. However, in infants, significant cephalhematoma (subgaleal blood collection) can result in hypotension and anemia. Also, children with hydrocephalus and ventriculoperitoneal shunt can accumulate large intracranial clots without evidence of increased ICP. Rarely, spinal cord injury can result in hypotension. Spinal injury is rare in children (< 5% of all spinal injuries) and usually involves higher spinal segments. However, always protect the neck with a hard collar, and if the lateral cervical spine x-ray film is normal, do not remove the collar until movement of all 4 limbs has been observed. Do not forget that in children younger than 15 years, the accepted normal atlantoaxial distance in the true lateral cervical spine x-ray film is 4 mm. When elevated ICP is due to a surgical lesion, surgery is the treatment of choice. However, management of elevated ICP should be an integral part of the management for every patient with a head injury. Quite often, as in cases with diffuse brain injury, ICP control is the mainstay of the initial treatment. The main aim of ICP treatment in patients with head injury is to maintain an adequate CPP (CPP = mean arterial pressure - ICP). In adults, the optimal CPP is recommended as greater than 70 mm Hg. In children, limits are not set, but generally, lower values are accepted. Further, while a persistent ICP of 25-30 mm Hg is considered invariably fatal in adults, the same does not apply in children. For reasons not fully understood, children survive higher and more prolonged ICP values. Elevate the head to 30-40°. Avoid constriction of jugular return (but protect the cervical spine if necessary). Avoid hypotension, hyperglycemia, or electrolyte disturbances. Exclude the presence of surgical lesions (CT scan). If the GCS score is less than 8, ventilate the patient. Ventilate to achieve a normal PCO2 value. Make sure general measures have been applied. Check pupillary size and reactivity. Evaluate the necessity of performing an urgent CT scan examination. Administer mannitol at 1 g/kg, followed by 0.25 g/kg every 6 hours (serum osmolality 320 mOsm). Consider alternating with frusemide at 1 mg/kg. Maintain the patient's central venous pressure at normal. Hyperventilate the patient to achieve a PCO2 of 3-3.5 kPa. Consider surgical options (eg, craniectomy, lobectomy). Maintaining adequate ABCs is more important initially than sending a child with a head injury straight to the CT scan or neurosurgical unit. Remember that the child will be severely compromised or die from the systemic injuries sooner than from the head injury. Furthermore, realizing that advanced measures for controlling the ICP (eg, heavy sedation and barbiturate coma) should only be considered in an appropriately monitored environment (ie, intensive care unit) is vital. The administration of mannitol can be an early therapeutic maneuver, but the neurosurgeons or admitting pediatricians should be fully informed before they commence treatment. Obtaining an adequate history and performing an adequate examination is vital for management and for an effective and speedy referral to a specialist center. Remember that the accepting doctor has to rely on this information to assess the severity of the situation and advise accordingly. Involve other specialties (eg, anesthetists) early. If in doubt, do not be afraid to ask. Do not dismiss parental concerns. They tend to be correct. Marin JR, Weaver MD, Yealy DM, Mannix RC. Trends in visits for traumatic brain injury to emergency departments in the United States. JAMA. 2014 May 14. 311 (18):1917-9. [Medline]. Orledge JD, Pepe PE. Out-of-hospital spinal immobilization: is it really necessary?. Acad Emerg Med. 1998 Mar. 5(3):203-4. [Medline]. Hadley MN, Walters BC, Grabb PA, Oyesiku NM, Przybylski GJ, Resnick DK, et al. Guidelines for the management of acute cervical spine and spinal cord injuries. Clin Neurosurg. 2002. 49:407-98. [Medline]. Lockey D, Davies G, Coats T. Survival of trauma patients who have prehospital tracheal intubation without anaesthesia or muscle relaxants: observational study. BMJ. 2001 Jul 21. 323(7305):141. [Medline]. Cooper A, DiScala C, Foltin G, Tunik M, Markenson D, Welborn C. Prehospital endotracheal intubation for severe head injury in children: a reappraisal. Semin Pediatr Surg. 2001 Feb. 10(1):3-6. [Medline]. Winchell RJ, Hoyt DB. Endotracheal intubation in the field improves survival in patients with severe head injury. Trauma Research and Education Foundation of San Diego. Arch Surg. 1997 Jun. 132(6):592-7. [Medline]. Gabriel EJ, Ghajar J, Jagoda A, Pons PT, Scalea T, Walters BC. Guidelines for prehospital management of traumatic brain injury. J Neurotrauma. 2002 Jan. 19(1):111-74. [Medline]. Stern SA, Zink BJ, Mertz M, Wang X, Dronen SC. Effect of initially limited resuscitation in a combined model of fluid-percussion brain injury and severe uncontrolled hemorrhagic shock. J Neurosurg. 2000 Aug. 93(2):305-14. [Medline]. Rotstein OD. Novel strategies for immunomodulation after trauma: revisiting hypertonic saline as a resuscitation strategy for hemorrhagic shock. J Trauma. 2000 Oct. 49(4):580-3. [Medline]. Tolias CM, Wasserberg J. Critical decision making in severe head injury management. Trauma. 2002. 4:211-221. Greenberg MS. Handbook of Neurosurgery. 4th ed. Lakeland, Fla: Greenberg Graphics; 1997. Roberts I, Yates D, Sandercock P, Farrell B, Wasserberg J, Lomas G, et al. Effect of intravenous corticosteroids on death within 14 days in 10008 adults with clinically significant head injury (MRC CRASH trial): randomised placebo-controlled trial. Lancet. 2004 Oct 9-15. 364(9442):1321-8. [Medline]. [Full Text]. Shackford SR, Zhuang J, Schmoker J. Intravenous fluid tonicity: effect on intracranial pressure, cerebral blood flow, and cerebral oxygen delivery in focal brain injury. J Neurosurg. 1992 Jan. 76(1):91-8. [Medline]. Garretson HD, McGraw CP, O’Connor C. Effectiveness of fluid restriction, mannitol and furosemide in reducing ICP. Ishii S, Naghai H, Brock M, eds. Intracranial Pressure V. Berlin: Springer-Verlag; 1983. 742-745. Schrot RJ, Muizelaar JP. Mannitol in acute traumatic brain injury. Lancet. 2002 May 11. 359(9318):1633-4. [Medline]. Ritter AM, Muizelaar JP, Barnes T, et al. Brain stem blood flow, pupillary response, and outcome in patients with severe head injuries. Neurosurgery. 1999 May. 44(5):941-8. [Medline]. Cruz J, Minoja G, Okuchi K. Improving clinical outcomes from acute subdural hematomas with the emergency preoperative administration of high doses of mannitol: a randomized trial. Neurosurgery. 2001 Oct. 49(4):864-71. [Medline]. Cruz J, Minoja G, Okuchi K. Major clinical and physiological benefits of early high doses of mannitol for intraparenchymal temporal lobe hemorrhages with abnormal pupillary widening: a randomized trial. Neurosurgery. 2002 Sep. 51(3):628-37; discussion 637-8. [Medline]. Bayir H, Clark RS, Kochanek PM. Promising strategies to minimize secondary brain injury after head trauma. Crit Care Med. 2003 Jan. 31(1 Suppl):S112-7. [Medline]. Fisher B, Thomas D, Peterson B. Hypertonic saline lowers raised intracranial pressure in children after head trauma. J Neurosurg Anesthesiol. 1992 Jan. 4(1):4-10. [Medline]. Shackford SR, Bourguignon PR, Wald SL, Rogers FB, Osler TM, Clark DE. Hypertonic saline resuscitation of patients with head injury: a prospective, randomized clinical trial. J Trauma. 1998 Jan. 44(1):50-8. [Medline]. Kamel H, Navi BB, Nakagawa K, Hemphill JC 3rd, Ko NU. Hypertonic saline versus mannitol for the treatment of elevated intracranial pressure: a meta-analysis of randomized clinical trials. Crit Care Med. 2011 Mar. 39(3):554-9. [Medline]. Chadwick D. Seizures and epilepsy after traumatic brain injury. Lancet. 2000 Jan 29. 355(9201):334-6. [Medline]. Perron AD, Brady WJ, Huff JS. Concussive convulsions: emergency department assessment and management of a frequently misunderstood entity. Acad Emerg Med. 2001 Mar. 8(3):296-8. [Medline]. Temkin NR, Dikmen SS, Wilensky AJ, Keihm J, Chabal S, Winn HR. A randomized, double-blind study of phenytoin for the prevention of post-traumatic seizures. N Engl J Med. 1990 Aug 23. 323(8):497-502. [Medline]. Temkin NR. Antiepileptogenesis and seizure prevention trials with antiepileptic drugs: meta-analysis of controlled trials. Epilepsia. 2001 Apr. 42(4):515-24. [Medline]. Hughes J, Maguire S, Jones M, Theobald P, Kemp A. Biomechanical characteristics of head injuries from falls in children younger than 48 months. Arch Dis Child. 2015 Sep 17. [Medline]. Aymes S. Severe Head Injury in Infants More Likely With Fall Above Two Feet. Reuters Health Information. Available at http://www.medscape.com/viewarticle/851577. September 28, 2015; Accessed: November 24, 2015. Alderson P, Roberts I. Corticosteroids for acute traumatic brain injury. Cochrane Database Syst Rev. 2000. CD000196. [Medline]. Bracken MB. Pharmacological interventions for acute spinal cord injury. Cochrane Database Syst Rev. 2000. CD001046. [Medline]. CRASH Trial Management Group. Possible explanations for the results of CRASH - Author's reply. Lancet. 2005 Jan 15-21. 365(9455):213-214. Gupta AK, Bullock MR. Monitoring the injured brain in intensive care: present and future. Hosp Med. 1998 Sep. 59(9):704-13. [Medline]. King BS, Gupta R, Narayan RK. The early assessment and intensive care unit management of patients with severe traumatic brain and spinal cord injuries. Surg Clin North Am. 2000 Jun. 80(3):855-70, viii-ix. [Medline]. Kushwaha VP, Garland DG. Extremity fractures in the patient with a traumatic brain injury. J Am Acad Orthop Surg. 1998 Sep-Oct. 6(5):298-307. [Medline]. Langham J, Goldfrad C, Teasdale G, Shaw D, Rowan K. Calcium channel blockers for acute traumatic brain injury. Cochrane Database Syst Rev. 2000. CD000565. [Medline]. Marion DW. Management of traumatic brain injury: past, present, and future. Clin Neurosurg. 1999. 45:184-91. [Medline]. Mattera CJ. Spinal trauma: new guidelines for assessment and management in the out-of-hospital environment. J Emerg Nurs. 1998 Dec. 24(6):523-34; quiz 535-8. [Medline]. Meyer P, Legros C, Orliaguet G. Critical care management of neurotrauma in children: new trends and perspectives. Childs Nerv Syst. 1999 Nov. 15(11-12):732-9. [Medline]. Mueller FO. Fatalities from head and cervical spine injuries occurring in tackle football: 50 years' experience. Clin Sports Med. 1998 Jan. 17(1):169-82. [Medline]. Choux M, Di Rocco C, Hockley AD, Walker ML, eds. Paediatric Neurosurgery. London UK: Churchill-Livingstone; 1999. Petri R, Gimbel R. Evaluation of the patient with spinal trauma and back pain: an evidence based approach. Emerg Med Clin North Am. 1999 Feb. 17(1):25-39, vii-viii. [Medline]. Rekate HL, Theodore N, Sonntag VK, Dickman CA. Pediatric spine and spinal cord trauma. State of the art for the third millennium. Childs Nerv Syst. 1999 Nov. 15(11-12):743-50. [Medline]. Roberts I. Barbiturates for acute traumatic brain injury. Cochrane Database Syst Rev. 2000. CD000033. [Medline]. Scher AT. Rugby injuries to the cervical spine and spinal cord: a 10-year review. Clin Sports Med. 1998 Jan. 17(1):195-206. [Medline]. Schierhout G, Roberts I. Anti-epileptic drugs for preventing seizures following acute traumatic brain injury. Cochrane Database Syst Rev. 2000. CD000173. [Medline]. Schierhout G, Roberts I. Hyperventilation therapy for acute traumatic brain injury. Cochrane Database Syst Rev. 2000. CD000566. [Medline]. Schierhout G, Roberts I. Mannitol for acute traumatic brain injury. Cochrane Database Syst Rev. 2000. CD001049. [Medline]. Stiefel MF, Spiotta A, Gracias VH. Reduced mortality rate in patietns with severe traumatic brain injury treated with brain tissue oxygen monitoring. J Neurosurgery. 2005. 103:805-811. Suarez JI, Ulatowski JA. Narcotics for brain-injured patients? At what cost?. Crit Care Med. 1999 Feb. 27(2):262-3. [Medline]. Swann IJ, McCarter DH. Investigation of the head injured patient. J Accid Emerg Med. 1998 Sep. 15(5):337-43. [Medline]. [Full Text]. Talbert S, Talbert P. Summary of strategies for managing severe traumatic brain injury during the early posttraumatic phase. J Emerg Nurs. 1998 Jun. 24(3):254-8. [Medline]. Teasdale GM, Graham DI. Craniocerebral trauma: protection and retrieval of the neuronal population after injury. Neurosurgery. 1998 Oct. 43(4):723-37; discussion 737-8. [Medline]. Tolias CM, Reinert M, Seiler R, Gilman C, Scharf A, Bullock MR. Normobaric hyperoxia--induced improvement in cerebral metabolism and reduction in intracranial pressure in patients with severe head injury: a prospective historical cohort-matched study. J Neurosurg. 2004 Sep. 101(3):435-44. [Medline]. National Center for Injury Prevention and Control. Centers for Disease Control and Prevention. Traumatic Brain Injury. Atlanta, Ga: [Full Text]. Working Party of the Royal College of Surgeons of England. Report of the working party on the management of patients with head injuries. London, UK: Royal College of Surgeons of England; 1999. [Full Text]. Wright MM. Resuscitation of the multitrauma patient with head injury. AACN Clin Issues. 1999 Feb. 10(1):32-45. [Medline].